"This book invites readers to a delightful new way to wake up to our lives. No matter what you're doing - digesting, doubting, deep thinking, or divorcing - there's a doodle for it. The author knows how to bring out the artist in each of us as she teaches us to hold our experience and ourselves in loving awareness. So go ahead, doodle it!" "Everyone needs to play -- adults and children alike! Play is a the cutting-edge of growth and creativity. 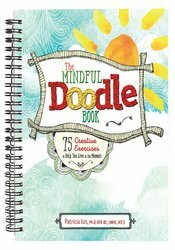 The Mindful Doodle Book is a fun-filled journey towards self-expression and self-discovery. This bottom-up approach frees the hand in order to focus the mind and open the heart."